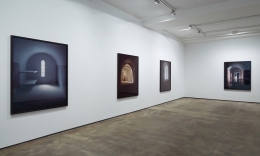 Sean Kelly announces James Casebere: Selected Works, 1995-2005, a special selection of some of the artist’s most iconic images from sold out editions, spanning a decade of his almost four-decade long career. Throughout his oeuvre, Casebere has built models of increasing complexity based on art historical, architectural and cinematic sources, photographing them in the highly controlled environment of his studio. This exhibition provides a unique insight into the development of Casebere’s thinking during a specific ten-year period of growth. The earlier pared down forms of works such as Arcade (1995) and Two Bunk Cell (1998) were photographed in muted, subtle tones, as Casebere made the transition from the black and white imagery of his early works to the vibrant color images with which he is now associated. 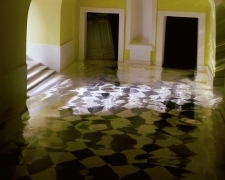 Four works from the early 2000s are a part of the exhibition as well, including Pink Hallway #3 and Monticello #3, from a series based on Thomas Jefferson’s home and other structures from the American colonial period. 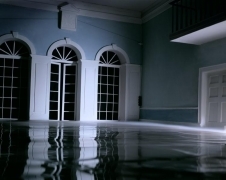 In these images, Casebere replicates the interiors in exacting detail, but floods them – an effect achieved with a resin used in architectural models to represent water – a statement to some extent on the discrepancy between the founding principles of American democracy and their selective and imperfect realization. The most recent work in the exhibition, the haunting Abadia (From Lower Left), (2005), was inspired by a trip to Southern Spain and is an important precursor to a later series of works called The Levant, which is based on buildings in the eastern region of the Mediterranean. 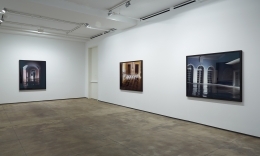 Casebere’s photographs have often dealt with themes of social control and the history of institutional spaces. The particular works brought together for this exhibition explore the creation and development of certain cultural institutions – and practices – such as education, incarceration, and economic relations, while pointing to the continuing relationship between our secular and religious histories. James Casebere is represented in public and private collections worldwide including the Museum of Modern Art, New York; the Solomon R. Guggenheim Museum, New York; the Metropolitan Museum of Art, New York; the Whitney Museum of American Art, New York; the National Gallery of Art, Washington, DC; the Los Angeles County Museum of Art, Los Angeles; the Musée d’Art Contemporain de Montréal, Canada; the National Gallery of Canada, Ottawa; the Goetz Collection, Munich, Germany; the Mukha Museum, Antwerp, Belgium; the Victoria and Albert Museum, London, England; and the Tate Modern, London, England. In addition to his participation in the Seville Biennial, Seville, Spain, and the 2010 Whitney Biennial, Casebere has been included in The Pictures Generation exhibition at the Metropolitan Museum of Art in 2009, Haunted: Contemporary Photography/Video Performance at the Solomon R. Guggenheim Museum and After the Gold Rush at the Metropolitan Museum of Art, both in 2010. Currently his work is included in Classless Society, on view at the Francis Young Tang Teaching Museum and Art Gallery at Skidmore College in Saratoga, New York. Casebere was commissioned by The New York Times Magazine to create the cover image for their May 5, 2013 issue. A major monograph on his work, James Casebere, Works 1975-2010, edited and with an interview by Okwui Enwezor, an essay by Hal Foster, and a foreword by Toni and Ford Morrison, was published by Damiani in the fall of 2011, and is available at the gallery. Concurrently, Sean Kelly will present Liminal, an exhibition of new paintings by Callum Innes.